Whiskas Junior Salmon is a complete dry food that offers your kitten the best start in life, containing all the vital nutrients needed for healthy development up to 12 months. It can also be fed to pregnant or lactating cats, as it is rich in energy. It is particularly important during these early growth phases that your cat receives everything it needs for a longer and healthy feline life. Energy and protein needs are increased as the body grows and develops. It is equally important that you feed your kitten a diet rich in vitamins, minerals and nutrients. Whiskas Junior Salmon offers balanced feline nutrition to ensure all-round health and satisfaction. Each of the croquettes, in a range of fun and colourful pieces, offers a different taste experience for your kitten. 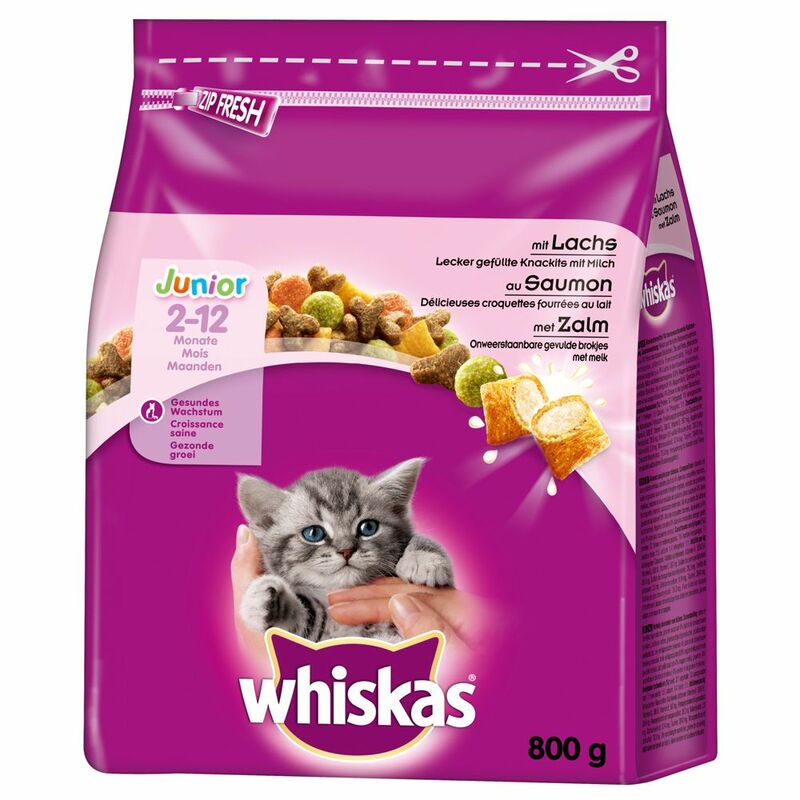 Whiskas Junior Salmon at a glance: Complete food for growing kittens up to 12 months, as well as pregnant or lactating cats Balanced, complete nutrition Delicious filled pockets with milk: crispy on the outside, soft and delicious on the inside! Increased vitamin E and taurine content: to support the body's natural defences Minerals: for urinary tract health Fibre: to improve digestion With calcium: for optimum development of strong and healthy teeth and bones EΒential oils for healthy skin and gloΒy fur Free from artificial colours, flavours and preservatives Practical plastic seal: close up the bag between uses to keep food fresher for longer.